Dermot Butler and Carl Nally. 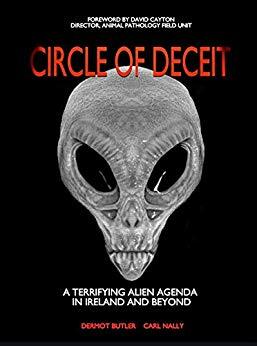 Circle of Deceit: A Terrifying Alien Agenda in Ireland and Beyond. Flying Disk Press, 2018. David Cayton, director of the ‘Animal Pathology Field Unit’ provides the foreword where he describes investigating the mutilation of a pony called Rascal. From the start his efforts were thwarted by the Sussex police who feared that if they released any details it would inspire copycat attacks. His frustration at not getting hold of the post-mortem report on the animal, lead him to think there is a high level of collusion between official entities like the police and the Royal Veterinary College to keep the lid on such cases. Adding to mystery is that a UFO was seen in the vicinity a few weeks before Rascal’s demise. Five years later in 2015, a spate of similar animal mutilations occurred in the north of Leicester at Syston. Again, David believes officialdom obstructed any further research and put forward ludicrous explanations to keep away the curious. 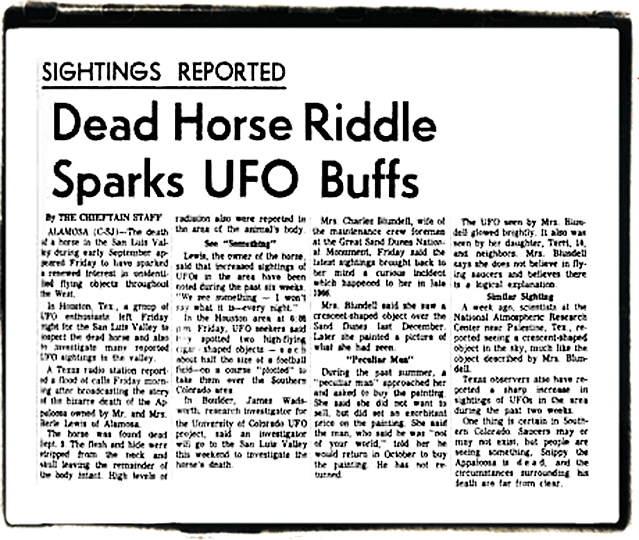 Dermot and Carl recount the case of the mutilated horse Lady (usually called Snippy in the media and UFO books) that was discovered in September 1967 near some strange radioactive traces in the ground. This was probably the first instance of animal mutilation linked to UFOs, and by the 1970s cattle mutilations linked to the appearance of mystery helicopters became so frequent in parts of the USA that they became the subject of the 1980 documentary A Strange Harvest by Linda Moulton Howe. Like the British cases, the US authorities were quick to offer explanations, claiming the incidents as being due to predators, cultists, satanists or deranged individuals. They did not take into account sightings of UFOs, humanoids or phantom helicopters in their vicinity and failed to explain laser-like surgery used to bloodlessly remove the organs of these animals. Dermot and Carl go on to provide examples of historical cases and incidents right up to the modern-day that have occurred throughout the world. They note in particular UFO researcher Tony Dodd’s investigations in the UK, which led him to believe government personnel were coerced into changing their testimony about such cases and that evidence was ‘lost’ in the system. This sets the scene for the core of the book which deals with the numerous surgically precise mutilations of lambs and sheep on a farm in County Derry, Northern Ireland spanning a period of twenty years. The 120 acre farm owned by Gerald (Ger) McLaughlin suffered at least 500 dead and mutilated sheep by 2015. The authorities (again) blamed the mutilations either on natural predators or a ritualistic cult, yet they were unable to find any definitive cause for the death of these animals. Officials later said the sheep died of natural causes and reaffirmed that vermin were responsible for the mutilation of their corpses. The efforts by the family to get the police, politicians, official bodies and news organisations to examine these strange deaths is documented in detail. Mostly they were ignored or fobbed off with mundane explanations. Even when a private security team was paid to conduct an overnight stakeout of the farm in 2006, nothing was seen because they suddenly left at 2am without any explanation. By 2008, in exasperation, they sent a report on the animal deaths to the European Union. This like all their other petitions fell on deaf ears. By the end of 2009 a human suspect for these occurrences died and the killings seemed to stop, but early next year ‘all hell broke out.’ As before the focus seemed to be on mutilating the tongues of sheep and lambs. In May they spoke on the telephone to a female police officer who inadvertently read from her computer that no call outs should be made to them if it is relation to ‘sinister cases’. The McLaughlin’s persistently wrote letters and emails to officials and organisations but continued to get little joy from them. They and the authors seem to indicate this is proof of a comprehensive cover-up, yet it is more a sign that the authorities were fed-up with saying the incidents were due to mundane causes and there is nothing to investigate beyond that. Certainly there was no evidence they were linked to UFOs or any other type of mysterious phenomenon.